IS WORLD NO. 1 RORY MCILROY an old 26? Maybe so with 21-year-old Jordan Spieth now leading the charge in golf. When did golf become so youthful? Last summer, McIlroy was golf’s transcendent figure, with victories in the British Open and the P.G.A. Championship leaving him one Masters title from a career Grand Slam. Having taken the mantle from Woods, though, McIlroy, now 26, found Spieth, an avid basketball fan, battling him for it as if it were a jump ball. Spieth could have supplanted McIlroy at No. 1 with a victory Monday. His tie for fourth only delayed what appears inevitable. Once hailed as golf’s young gun, McIlroy must feel, suddenly, as if 26 is the new 36. Spieth, who turns 22 next week, is blazing a trail for the millennials. On Monday he battled rain, wind, a few golf ghosts, his putter and the Road Hole and came within a holed chip or a made 6-footer of joining Zach Johnson, Marc Leishman and Louis Oosthuizen in a playoff. Spieth’s play in the first three majors disinterred sepia-toned memories of Bobby Jones, who opened his successful Grand Slam bid in 1930 with a victory in the British Amateur at the Old Course. 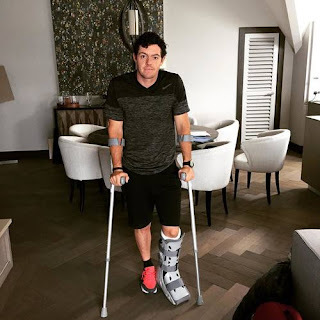 Rory needs to get healthy and hurry back. For a lot of reasons.